I don't have any sugar in the house right now anyways, so unsweetened cocoa powder really does me no good. And I'm hoping this proves a valuable lesson in not getting into the cupboards and eating things that mommy did not approve of. Because really? Plain old cocoa is not pleasing to the tastebuds. My daughter's generalization when it comes to learning life lessons isn't exactly stellar, so I suspect this won't be the last time I find the contents of my cupboard somewhere other than in the cupboard. Especially since its not the first. Hopefully though, the cocoa is safe from now on. This whole situation is really my fault since I was still upstairs in my bedroom when the incident occurred, slowly pulling myself out of a groggy stupor and trying to motivate myself to get out of bed. But at that moment, no size of mess or disaster that might happen while I wasn't looking was reason enough to get up. It didn't matter what happened downstairs... I did not want to move. 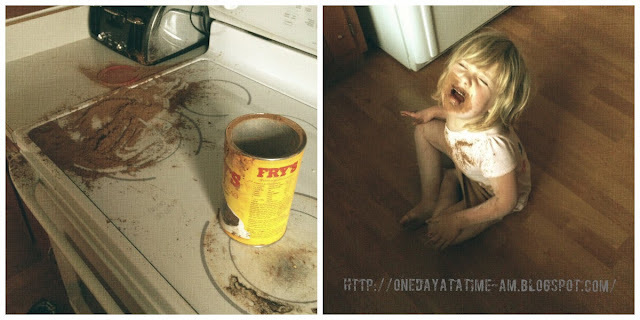 Until I heard a tattletale voice float up the stairs... "Finleigh dumped the cocoa." That was the motivation I needed. I still had to strip my bed sheets, which bore signs of my daughter's escapades as I slept. There was the blood streaks from where she got ahold of my razor (don't ask me how she did it, it was hiding up high, but obviously not high enough) and cut her finger. Also there were a few handprints of the zinc oxide based sunscreen that I had inexplicably left in the bathroom that she has access to in the mornings. Why? I'm not quite sure. I'm hoping the sheets don't stain. I'm a heavy sleeper, I sleep through much of what Finleigh does in the wee hours of the morning. But, it's rare that I'm still sleeping at 8:30 am. The boys have learned to wait for a parent to be up before they open the gate that keeps Finleigh contained upstairs (something I regret that they have to do... but its that or a Finleigh tornado). So the kids were understandably feeling antsy and a wee bit hungry when I finally regained foggy consciousness. Which is why I sent them downstairs ahead of me. And now, I'm still walking around in a bit of a fog. Conscious of all those things I should be doing but am not. I have begun a new chapter in my life. One that involves medication to help me. Medication to take away the physical and emotional symptoms that I've been living with for far too long. It explains my fogginess this morning since I'm still getting used to things. And why this post may not be as clear as it could be. I hope to God they help. Oh, how wonderful it would be if the chest tightness - among other things - would go away. If I could count on getting a deep breath whenever I wanted, instead of when some mysterious force deciding it for me. If my interest in daily interactions with my children would become natural again instead of forced. If I didn't always feel so bone tired. Deep down, I can't go on, feel it in your very soul tired. I guess time will tell. For now, I'll go clean up some cocoa.